Pixel 3a: Google's mid-range smartphone leaks in a photo No updates for eight months...has LG given up? [Free App][Talking Battery Doctor], This smart App will Announce the battery Status of your Mobile. Today the life is too busy that its very difficult and hard for the android users to check their battery status again and again, Which create a lot of problem for all the users when their battery get down and there is no source available to charge it. Some time the android users forget to unplug their device from charging when it is fully charged which also effect battery life and performance. But no need to worry now because Mobile Tools Shop (MTS) team is always there to bring solutions for your problems. 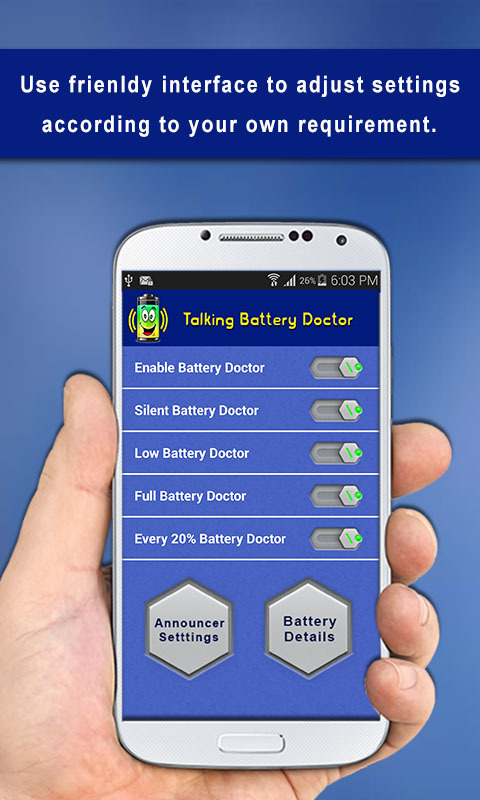 We are now presenting the Talking Battery Doctor application which is a complete battery doctor for your android device. In short you can call this application a Mobile Battery Doctor. Because it always check the health of your device battery and notifies you. This talking battery doctor app has a lot of feature beside it speak the battery status. This application keeps your updated on your mobile battery level. Talking Battery Doctor you to charge your mobile timely which will definitely solve your big problem.  > Just install it on your device.  > There are various options available on the home screen which you can Enable/ Disable according to you own requirements. These options are. Enable or Disable the application by simply one click. Silent battery doctor gives you an option whether you want the battery notification enable or disable in silent mode. Low battery doctor will notification when battery is critically low. Full battery doctor will give notification when battery is fully charged. Every 20% battery doctor will give notification for your battery status after each 20% charge or discharge. I have used so many battery doctors to get the correct battery charge value. But none shows the correct value. do your app show perfect correct value? Thanks for the comment. Yes i have tested my app on various devices and result shows the correct figure/battery charge value. You can try it and what ever is your experience just share it in App review box. Okay Let me check your app with my device, i will surely post review on your app in app store. I have used so many battery doctors to get the correct battery charge value.